Although we can’t promise to turn you into Grandmaster Flash overnight, we can show you the absolute best DJ software for Mac in 2019 to set you on your way. The good news is that when it comes to DJ software, Mac users have not been ignored by software developers. Most of the top DJ software that is available for Windows is also available for Mac. Even better, professional level DJ software on Mac doesn’t have to be expensive either. As you’ll see, some of the top DJ apps for Mac are even free and most have fully functional free trials so that you can try before you buy. So whether you’re a beginner wanting to DJ at a party or a professional looking to make the step up to DJ a club or a major live gig, there’s something for everyone. Here then is our list of the top DJ software for Mac users in order of ranking. Algoriddim djay Pro (more commonly known simply as “djay Pro”) is designed specifically for Mac and is easily one of the best mixing software out there for Apple fans. djay Pro manages to be unbelievably slick on retina and 5K Macs, accessible, user-friendly and yet the Pro version is still powerful enough for intermediate level DJs on Mac. Although it claims to be a professional level software, the reality is that it lacks features of the very top DJ software and you won’t find many world-famous DJs using it but is still a superb package, especially for those that want a DJ software they can start and grow with. djay started life on iPad but is now embraces the entire Apple family with apps for Mac, iOS and even the Apple Watch. The djay Pro interface looks great on Mac and it has won an Apple Design Award for its turntable view which realistically recreates vinyl decks on Mac. There are two versions: djay 2 ($4.99) which is only for mobile DJs on iPad, iPhone or Android and djay Pro for ($49.99) which is the Mac version. djay allows you to mix not only audio but even video too with support for 4-deck mixing, decks, 50 different MIDI controllers, drum pads, loops, beat matching and colored waveforms. There are added audio effects although these require a modest in-app purchase of $9.99 for the full FX pack. djay Pro also supports a wide range of controllers including from Pioneer, Numark, Phillips and Griffin. You can even browse your Spotify and iTunes library from Pioneer CDJ/XDJ controllers with data on cue points, waveforms, BPM etc. One of the biggest draws of djay Pro for Mac nowadays however is its unique support for both Spotify (premium) and iTunes. djay was actually the first and still only DJ software to support integration with Spotify. You can automatically connect djay Pro to both Spotify and iTunes accounts and use tracks from both to mix, and even allow it to auto mix them so you don’t have to lift a finger. Alternatively, if you prefer to be hands-on you can use the “Match” feature which recommends tracks that will mix well into tracks you are playing. Integration with Apple products even goes as far as iCloud as it lets you sync cue points with the iOS version that you can then work with later on Mac. djay Pro is an excellent DJ software for beginners and intermediate level users on Mac although it’s definitely a stretch to rank it up there with truly professional offerings such as Traktor Pro, Serato and VirtualDJ. The lack of DVS support for external controller deck scratching in particular is a big drawback for real Pros. For those that want total Apple product and Spotify, it’s definitely the best DJing software that Mac users can get though. Mixvibes Cross is a French based DJ software that’s been around for over 15 years and is great for those that want a user-friendly DJ software to grow with. The free trial version of Cross DJ Free works on both Mac and PC and is a great way to get started with support for 2 decks, mixer and iTunes integration which makes it simple enough for anyone to get started. The intermediate version Cross DJ is $49 and allows you to use up to 4 decks but you’ll need Mixvibes Remixlive ($49) to integrate with Ableton Live (see review below) while there’s also Mixvibes Remixvideo for an extra $99 which supports video mixing, CDJ control and vinyl mixing (DVS). Mixvibes Cross supports one of the largest array of controllers out there with over 80 different controller and digital vinyl systems. The free version doesn’t support any controllers although you can use the iOS app Cross DJ iOS Remote to control it. If you upgrade, you can use over 80 different controllers and enjoy visual waveforms and detect musical keys. Mixvibes also developed the Pioneer rekordbox which you can import into Cross products. Mixvibes is one of the few DJ software for Mac users that supports SoundCloud (no premium account needed) as well as iTunes although Spotify is not supported. SoundCloud support is generally very good with fast retrieval of tracks as if they were on your Mac. You can also Automix all tracks as Mixvibes will mix and match tracks from across your collection. Other useful features include video mixing, hotcues, loops, beat detection, three-band equalizer and audio effects. If you’re looking to get into Djing for free, Cross DJ Free is a great way to start although if you want to use a controller, you’ll have to upgrade. Mixxx is one of those amazing DJ applications that remarkably offers professional level features and is completely free to use. Mixxx is an open source DJ software for Mac, PC and Linux which you can not only download for free but even customize it for yourself if you know what you’re doing with coding. Mixxx features two or four decks that you can scratch, iTunes integration, loops, hot cues, pitch bending, BPM detection and syncing and an Auto DJ function for when you’re feeling lazy. Mixxx Controller support isn’t the biggest out there but there are at least 30 timecode vinyl systems supported. Mixxx also includes four sampler decks, sound effects and clever ways of organizing your music library into “crates”. The main issue you may find with Mixxx is that since its open source, there’s no official support system for it although there is a thriving Mixxx forum where you can often find solutions to common problems or issues. Mixxx is an amazing DJ software to say that it’s completely free to use although this comes with risks for live performances. Since its open source, it may be subject to instability and bugs that haven’t been ironed out, especially when it comes to external device support and DVS. Atomix VirtualDJ has been around since 2003 (and was even around before then as AtomixMP3) and is probably the most widely used DJ software in the world with an estimated 150 million downloads. Part of the reason for this is that VirtualDJ offers a professional DJ platform absolutely free for non professional use. The philosophy behind VirtualDJ is that DJ talent shouldn’t be denied because you don’t have the money to purchase top of the range DJ equipment. Note however that the main drawback of the free version is that you can only use your trackpad and keyboard with it and if you want to use a controller, there are specific pricing plans starting at $49.99. If you are making money from Djing, you have to upgrade to a “Pro Infinity” license which will set you back $299 or $19 per month – expensive but definitely worth it for professionals making a living out of DJing. VirtualDJ is so good it’s been used by some of the biggest DJs out there including Carl Cox and Tiesto which says a lot about its pedigree. The range of support and features in VirtualDJ is staggering. 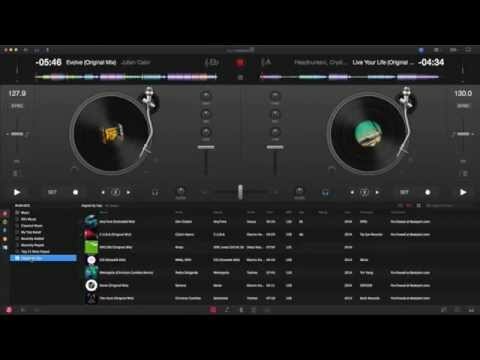 One of the most unique features of VirtualDJ Pro for example is that it can run up to 99 virtual decks – certainly not something you’d want to try but an idea of how much further this app goes in terms of power and support for DJs. VirtualDJ Pro is also popular because of its integration with other music creation software. VirtualDJ Pro supports ReWire meaning it works with all the major DAWs including Ableton Live. In the latest version you can preview mixes via “Sandbox” so that you can test mixes before they go live to your audience. Other features include the ability to automatically detect BPM, track matching, video mixing, on the fly sampler recorder, mix karaoke and even record podcasts with VirtualDJ. In terms of features, there are few packages out there that can touch Virtual DJ. If you want a karaoke DJ software for Mac, VirtualDJ even has that covered. VirtualDJ has a Netflix style subscription service called ContentUnlimited which allows you to retrieve thousands of karaoke tracks and videos. The service costs $19 per month but gives you access to a massive catalogue of HD karaoke videos. There’s also a service of ready-made remixes as part of the Music Plan ($9 per month) and the latest music videos as part of the Video Plan ($49.99 per month). VirtualDJ is a true professional DJ’s choice and the only other software that comes close to it on Mac are Sertao and Traktor (reviewed later in this article). Deckadance was originally developed by ImageLine makers of FL Studio (formerly FruityLoops – see our FL Studio for Mac review) and is aimed at intermediate to pro level DJs. Among other things, Deckadance is noted for its customisable interface, fine tuned controls, two or four deck mixing and a 16-slot sample player. Arguably the most interesting feature of Deckdance however is that it works with external VST and VSTi plugins which means you can use other third-party effects and instruments in Deckadance. Deckadance also has a powerful sampler that supports beat matching and other effect matching features known as “Smartknobs”, and “GrossBeat” that for preset stuttering and scratching. You can customize the interface via the use of smart panels and there’s extensive support for external MIDI devices, controllers and iTunes (but not Spotify). There’s also a remote control app for iOS and Android devices. Deckadance isn’t the most user-friendly DJ app out there but if you like something that allows a lot of customization and like the idea of using VST plugins, it’s definitely worth a closer look. Serato is up there with the best professional DJ software available for Mac and is used by some of the most famous DJs across the world including DJ Jazzy Jeff, Steve Aoki and Dave Clarke. Serato used to be divided into two separate applications – “Scratch Live” which has always offered some of the best DVS support out there and “Itch” for DJ control integration. Nowadays both have been combined into a powerful package with plug ‘n’ play support for almost any controller and ultra realistic views for both 2 and 4 deck mixing. Serato can get quite expensive depending on what you need support for though. This is because Serato is based on modules which means that some features such as DVS and MIDI support you have to add as an extra module to Serato. However, as standard you do get four decks, color waveforms, support for iTunes, Pulselocker, quick syncing controls for instant BPM matching, hotcues and loops. Serato also uses a unique “crate” system (similar to Mixxx) to help keep your music organized – a bit like in the old days of vinyl when DJs would organize records into different crates. Serato allows you to mark up to 8 different cues so that you can queue-up mixes which you can then loop and quantize. The basic version of Serato costs $99 but you must add modules on top of that to extend the functionality to include DVS, loops and other effects. You can add advanced features such as VJing and but this is an example of an extra module mentioned earlier and costs $149 – not cheap. Alternatively you can also pay $9 per month to subscribe to Serato DJ which is the basic version of Serato or $14.99 per month to subscribe to Serrato DJ suite which includes all modules. Like all the very top DJing software out there, there’s also an iOS companion app Serato Remote ($19.99) which is synced with the Mac app. If you’re willing to put the hours in, Serato is an amazing DJ software with everything a professional needs It can get expensive with the modular business model but if you’re earning serious money from DJing, it’s a drop in the ocean. You can also read some interviews with professional DJs about why they use Serato. Although not strictly a DJ software, no reviews of DJ software would be complete without a mention for Ableton Live. Ableton Live is arguably the most professional and widely used DAW and sequencer on the market but has gradually added so much support for DJs that it’s now one of the most popular DJ tools for professionals across the globe. More accurately, Ableton Live is amazing at managing DJ sets from launching synced audio samples, to MIDI tracks and hosting plugins. There are now even Ableton controllers designed specifically for using with the software which gives you can idea of just how important it has become to the music industry as a whole. Ableton Live is about as good as it gets when it comes to multi-track recording and seamless MIDI sequencing. Mapping MIDI controllers is a breeze compared to many DAWS on this level. Other impressive features include the enormous sounds library and wide support for just about any controller, including custom made-for-Ableton controllers. There re over 400 drum kits and 4000 MIDI and audio samples alone meaning you can get incredibly creative with it. Although Ableton Live isn’t strictly DJ software, it is a fully fledged sequencer and digital audio workstation for creating and performing electronic music live, including DJ sets. Note however that there are no deck setups, support for DVS or other standard features you expect from professional DJ software. Because it’s a professional music creation software, Ableton Live doesn’t come cheap. There are three versions of Ableton Live – Intro, Standard and Suite. The full Ableton Suite edition costs $599 and is designed putting on large-scale gigs in professional arenas but the Intro Edition is manageable enough for beginners to DAWs to get into and costs a reasonable $79. Ableton Live is for those that want to go beyond DJing on their Mac and put together a truly professional live production. You can also try Ableton Live free for 30 days. Traktor Pro is easily the one of the most popular DJ applications ever released on Mac. Traktor Pro arguably has the best sample & remix decks, loop recorder, sound effects and BPM algorithms of any DJ application on either Mac or PC and as a result, is used by professional accross the globe. Native Instruments were originally in the hardware business before they made Traktor which means it also makes some of the best DJ controllers (the S2, S4, X1, F1 and Z1) for any DJ application. The controllers are designed specifically for use with Traktor Pro which means they’re incredibly versatile but also less prone to breaking with updates to OS X as Traktor update both the software and the controllers. In fact, so many DJ controller manufacturers now support Traktor Pro that they will display a “Traktor ready” endorsement on the packaging. The range of features in Traktor is huge but notably it supports up to four decks, each of which can store up to 64 samples has some excellent sync controls that track tempos, beatgrids, and musical key. It integrates with iTunes (although still not Spotify) and will automatically beat match for you. You can set up to 8 cue points and there’s probably no better applications for doing this with a controller than Traktor. In addition, you can see color coded waveforms to help you ssee as well as hear hi-hats, kicks and snares. When it comes to features and DJ controller compatibility, you simply can’t beat Traktor. It’s an amazingly powerful and flexible DJ software that’s trusted by the very top DJs out there. Dex 3 (formerly known as PCDJ DEX) is available for both Mac and PC although it’s not very well-known on Mac. That’s a shame because DEX 3 is actually an excellent remixing software for Mac users with support for 4 decks, VJ video mixing, and it’s ideal for karaoke sessions with a special karaoke mode. Other useful features include support for time-coded vinyl, CD control, automatic beat-matching and pitch scaling. DEX 3 even supports VSTi instrument including drum machines, synthesizers and other electronic instruments or effects. If you’re interested in VJing or video mixing on Mac, you can also mix and scratch videos with a host of special effects and transitions. DEX 3 is also one of the only DJ applications for Mac that supports Pulselocker. DEX 3 might not be on the radar of many DJs on Mac but especially for those that want a DJ software that offers VJ features, it’s worth checking-out. If you looking for something simple, CuteDJ Pro is definitely an interesting option for DJ novices on Mac. Easy enough for anyone to use with video and karaoke support too, CuteDJ Pro is fun and not overwhelming from the start like a lot of DJ apps on OS X. Cute DJ has all the standard features you’d expect in a DJ software including beat-matching, beat loops, cue points, sync, crossfader, auto key detection, and VST effects. It hasn’t got the best controller support out there but it does support most major MIDI controllers and up to 8 hardware controllers. The Pro version is ideal for mobile DJs, restaurants, radio stations, shops, dance studios and other businesses to broadcast mixed music from their Mac. Usually CuteDJ Pro costs $129.95 but it’s currently on offer for $49.95 and there’s also a fully functional free trial of CuteDJ Pro. These are our top ten DJ apps for Mac users but if you still haven’t found what you’re looking for, here’s one last option you might want to consider. Despite the name DJ Mixer Professional is suitable for both beginners and aspiring professional DJs. DJ Mixer Professional includes an impressive number of features including 4 decks, audio and video remixing, beat-matching, loops, keylocking, pitch shifting, and a sampler. There’s also MIDI controller support, vinyl simulation, a visual waveform display and full integration with iTunes. You can leave DJ Mixer Professional to automix your music, mix karaoke tracks, set cue points and define your own keyboard shortcuts. You can use DJ Mixer Professional for Mac free for 20 minutes per session although you’ll need to upgrade for $99.95 in order to unlock it for unlimited use. DJ Mixer Professional is surprisingly accessible for beginners to DJing but with enough advanced and professional features to grow into. It usually costs $149.95 but is currently on offer for $99.95. DJ Software For Mac: Which Is Best For You? The best DJ mixing software simplifies your workflow so that laying down tracks is a smooth as possible from idea to laptop. If you’re new to DJing or aren’t the most tech savvy DJ out there, the most complicated and fanciest DJ software on Mac might not necessarily be the best one for you. Our best advice if you’re starting out is to choose something simple that makes Djing as free-flowing as possible so you can concentrate on creating. Many of the DJ apps featured here allow you to upgrade to more advanced professional versions once you’ve got to grips with the entry-level versions. In addition to this, there are some other important things to consider before choosing which DJ software is right for you. Like anything, your choice of DJ software will probably be limited by your budget. Expect to pay anything between $100-$200 for the very top DJ software on Mac. If you’re serious about DJing, you should stretch your finances to the most you can afford and consider it as a long-term investment of around 5 years. From this perspective, a few hundred dollars isn’t really a lot to pay for a software that you’re going to use regularly or even make money from in that time. All the DJ software for Mac reviewed here offer free trials so you can also try before you buy. Many such as Cross offer a basic free version and a more advanced Pro version that you can upgrade to a later stage. This is a great way to learn the ropes for free before having to pay any cash for more advanced features to take your DJing to the next level. Some of the most advanced DJ software such as Traktor Pro and Serato can be extremely intimidating if you’ve never used a DJ software before. However, if you’re planning to take DJing seriously, then don’t be afraid to take the jump and go for pro-level software as you’ll need to learn how to use them at some point anyway. If you’re planning to DJ for fun however, you should definitely go for something entry-level to get you going first. If you feel somewhere in the middle, djay Pro is worth looking at because it’s very user-friendly but feels professional even if the feature set doesn’t measure up to the top products. Another important thing to consider is whether you want to use external DJ controllers with the software. This is particularly important if you want to do scratching. Some people still prefer an analog setup with hardware such as drum machines, decks, synthesizers, MIDI devices and VST instruments connected to their software although many DJs now prefer to do everything virtually on their Mac. Almost all decent DJ software nowadays supports external devices such as controllers and instruments but some support more than others. Traktor Pro is definitely the best in this respect as it’s made by Native Instruments who make DJ controllers. Whatever external devices you plan to use, make sure the DJ software you choose supports it first. Whichever remixing software for Mac you choose, there are some essential features that you should look for. Almost all Pro DJ and even many beginner DJ software for Mac includes these features but here are some essential ones to look out for. Loops and Samples. The quality and number of special loops and samples varies from app to app but there are also many other sites and sources where you can download samples and loops for your DJ sets. Cross Faders for mixing between tracks and standard in all DJ mixing software. Auto Beat Matching for seamlessly matching beats per minute (BPM) of tracks. This is often accompanied by an automix feature which will automatically remix songs and tracks for you. Pitch Controls to control the pitch and speed of tracks. Special Effects such as delays, rewinds, echos and other filters. Markers/Cue Points to set exactly where you want a track or song to start. The amount of cue points you can set in most mixing software but some allow you to set up to 8 cue points. This takes a lot of stress out of live DJing, especially for beginners. EQ Colored Wave Forms. Top DJs use sight as well as sound to mix and colored wave forms allow you to see different instruments on each track such as exactly where the bass comes in, vocals etc without even having to listen to the music. Scratching – if you want to be able to scratch physically on decks, you’ll need to purchase a controller (see above). You can also scratch virtually on your Mac but it’s not quite the same doing it on your trackpad as doing it on decks. Most of the very top DJ software on Mac support controllers nowadays allowing you to connect decks to your mixing software and scratch vinyl – look for support for Digital Vinyl System (DVS). Although DJing purists and old skool DJs may tell you that you have to learn scratching on vinyl first before moving onto controllers, the truth is you can learn how to scratch using controllers just as well. Whether digital sounds better than vinyl however is another question and many experienced DJs argue that vinyl sounds a lot better than digital audio. Spotify, iTunes and to a lesser extent, SoundCloud dominate the digital music industry although DJ software has been slow at catching up with Spotify and SoundCloud. Almost all the software featured here supports iTunes but only djay Pro supports Spotify. Note that many samples or loops however are only available in standalone file formats and can’t be used in Spotify or iTunes. The best DJ software for both Spotify and iTunes integration is undoubtedly djay by Algoriddm (see full review below) which even automatically searches your music collection to match songs for mixing. In fact, it’s by far the easiest DJ software for beginners due to the Automix Radio feature which automatically does the mixing for you – you don’t have to touch a thing. There are far fewer DJ apps that support SundCloud however although the Cross DJ range of software and Mixvibes both do. If you store all your music as MP3s, WAV, AIFF, MIDI or FLAC for example, then third-party music app integration isn’t essential for you. Nowadays most DJ software on Mac can import almost all major audio and in some cases, video formats including mp3, aac, m4a, wma, wav, flac, ogg, aiff and video avi, mpeg, mp4, mov, m4v, flv, mkv, wmv. Those that allow you to mix karaoke on Mac also support cdg+mp3 and cdg zip karaoke files. If you want to record or export your mixes, most also allow you to save mixes to mp3, wav, aiff or save the mix in CD-quality audio. However, if there’s a specific audio format that you’re planning to import or export from, you should check that the software supports it. Finally, music applications such as DJing software are often the slowest to be updated to be compatible with the latest versions of OS X due to their complexity. Some took several months for example to be compatible with macOS 10.12 Sierra so make sure that the DJ app you choose has a good track record when it comes to updates. Or at least, make sure you always wait a few weeks or months before updating the new versions of OS X to reduce the chance of problems with DJ software on Mac. However, even if the DJing software you use is updated regularly, if you use a DJ controller that requires drivers, they may not be updated as frequently by the manufacturer. This was the case recently with the DJ software Serato which was updated for macOS 10.12 Sierra but many DJ controller manufacturers had not updated their drivers to work with it. Finally, make sure you don’t get confused between music creation software for Mac and DJ software for Mac. Music creation software – also known as Digital Audio Workstations (DAW) – is aimed at composers and musicians to create tracks with. DJ software is focused on mixing and remixing tracks – not creating music from scratch like a Digital Audio Workstation. The best DAWs on Mac include software such as Ableton Live (which is the only one we’ve included here), Fruity Loops (see our review of Fruity Loops for Mac here) and Cubase. It can sometimes be hard to distinguish between the two and there are certainly some apps such as Ableton Live that are suitable for both DJing and music creation. All the software featured here is definitely suitable for DJing on Mac so if you go for one of these, you can’t go wrong. Although Mac users are well catered for when it comes to DJ apps, there is some DJ software that is still Windows only and not available for Mac. Don’t be fooled by sites that offer a “free download” for any of these titles – they do not exist on Mac. The most notable are all MAGIX Products including Acid (formerly Sony Acid), Magix Digital DJ, Music Maker, Samplitude Music Studio, Sound Forge, SpectraLayers and Independence Free Sampler. As we’ve seen there’s a huge choice of DJ software for Mac and these are our picks of the best ones. If we had to choose one, it depends on the level you’re at as a DJ. If you’re an entry-level DJ, then djay Pro is hard to beat on Mac, mainly due to the fact that it’s designed specifically for Mac and integrates with both iTunes and Spotify. It really couldn’t make it easier to start DJing and it will even mix automatically for you if you just want a one-off party mix. If you’re looking to get serious at DJing however, it’s hard to see past Traktor and Serato. Traktor is certainly the better option if its external controller support you’re looking for but Serato arguably has the best scratching and DVS support. Whichever you choose from the DJ software reviewed however, you really can’t go far wrong. We hope this guide has helped you start mixing the wheels of steel on your Mac but if you have any questions, problems, experiences or suggestions let us know in the comments below.